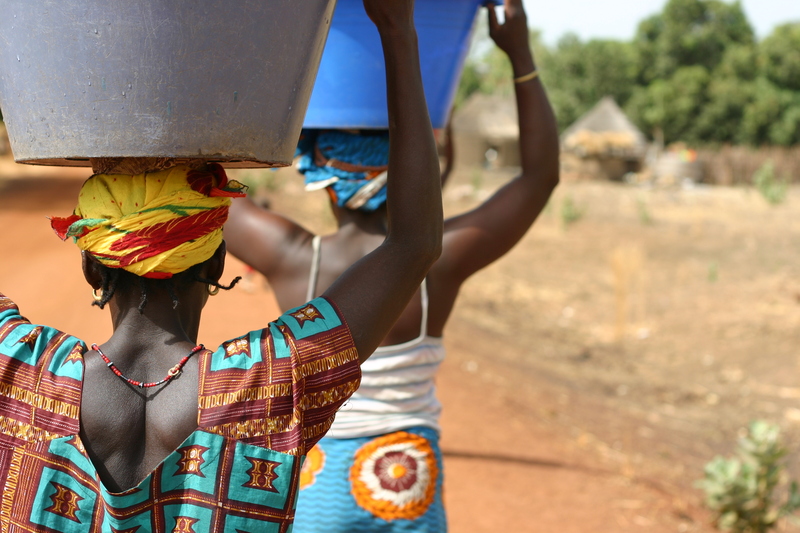 Four to six times a day, Bedik women haul water from a nearby well back to their community. Their feet have cut trails into the red earth and worn smooth the rocks along the paths up to their mountain villages. On one torrid afternoon in the village of Indar, a few women invited me along to take photographs. Moving between them as they walked and chatted leisurely, I snapped this shot of Denise and Marie. The image was taken as part of a larger ethnographic project on cultural tourism in Bedik villages in southeastern Senegal. Collaborative photography was used to explore how the Bedik wish to represent their culture to tourists and how they visualize Bedik identity. Villagers advised me to take pictures of Bedik women with traditional clothing and hairstyles, performing traditional tasks. Therefore, I was not surprised that this photograph of Denise and Marie was a favorite among the Bedik. Still, I was intrigued when villagers adamantly professed that these women are “le vrai Bedik”—the real Bedik. Several scholars have noted that, within cultural tourism’s “quest for the authentic”, women are disproportionally viewed as bearers of tradition and as gendered embodiments of exotic culture (Taussig, 1993). In the Senegalese tourism industry, the visual appearance of Bedik women similarly plays a central role in authenticating their culture and positioning the Bedik as purveyors of “real Africa”. Unlike Bedik men who habitually wear Western clothing, it is the women—with their colorful textiles, distinct braided hairstyles, and traditional piercings—that have captured tourists’ imaginations and the focus of their viewfinders. The image of Denise and Marie appeals to a “tourist gaze” through reproducing preconceptions of a gendered “authentic” Africa (Urry, 2002). Set against the thatched-roofed huts in the background, these women hauling water fulfill what Renato Resaldo coined “imperialist nostalgia”, wherein tourists long for “the very forms of life colonialism intentionally altered or destroyed.”(1989:108) This image sustains the perception, however illusory, that Bedik villages have remained uncorrupted by forces of globalization. Furthermore, the photograph echoes the fetishization of female labor, in which the motif of the female water-bearer has become indexical of African authenticity. The image also holds the promise of the art the tourist might create through their photographic experience. Mediated by a camera’s lens, there is a comfort and safety within encountering ‘other’ through the practice of art. As John Berger notes, “Art, with its unique, undiminished authority…makes inequality seem noble and hierarchies thrilling.”(1977:29) Thus, the image assures the tourist access to “real Africa” without having to engage with actualities of poverty and global inequality. Yet, despite the problematic ideologies belying its touristic appeal, the photograph simultaneously speaks to the agency of Bedik women. The tension in Marie’s muscular shoulders commands attention beneath her brightly-printed top and serves as a constant reminder of her embodied strength. Beneath the veneer of the tourist gaze, Bedik women are negotiating their authentic identity on their own terms. Bedik women have learned to use Western visual codes to exploit their position within definitions of authenticity. They don traditional clothing and hairstyles to better sell their art to tourists and charge a fee to take their picture. In calling Denise and Marie the “vrai Bedik”, the Bedik are also defining their authenticity in terms consistent with their cultural heritage, wherein women are respected possessors of cultural knowledge. The repeated posturing of their bodies with their backs to the camera creates a certain anonymity; they represent the strength of all Bedik women and, by extension, the endurance of Bedik culture. The image reveals that, while Bedik women shoulder the weight of gendered authenticity, they do so with agency and prowess. Rachel Tanur’s image, “African Man with Child”, provides a near-perfect inversion of the visual and conceptual dynamics present in my photograph of two Bedik women. While the women hauling water appeal to a tourist gaze and strategically reaffirm enduring imperialist notions of authenticity, Rachel Tanur’s arresting image disrupts and challenges these preconceptions. Walking along a paved sidewalk in a West African city, these figures in “traditional” ensemble instantly strike the viewer as anachronistic, out of place within their immediate social and spatial context. By presenting this visual disjuncture, the photograph pulls at the seams of socially constructed notions of authenticity that have dominated discourse on African identity. Tanur’s composition of the man and child is framed by a street sign in the left foreground reading “Avenue Chardy” and by a car-lined street receding into the background to the right. These visual representations of Western influence provide a dramatic foil for the body paint, feathers, and cowry shells adorning the two figures. Their striking, “traditional” appearance marks them as “authentic” and sets them apart from their modern, urban surroundings. In this way, “visual exoticism retains its enduring role in defining indigenous authenticity” (Conklin, 1997). Through its unharmonious juxtaposition of “traditional” Africans in a “modern” city, the photograph reminds us that African “authenticity” is not only indexed by the outward appearance of native bodies but also by romanticized imagery of foreign landscapes. As Harry Wels writes, Africans receive “shape, meaning, and a personality against their physical backdrop” within Western imaginings first propagated during the colonial period (2002). By emphasizing the man and child’s contrast with the quiet Western order of “Avenue Chardy”, the image evokes and challenges colonial imagery of the African wild through its very absence. Tanur’s image defiantly denies the viewer the vast sub-Saharan horizons, tribal huts, and African wildlife that are too frequently called upon to contextualize “authentic” African identities. Unlike the women in my image, the figures in this photograph face the camera, seemingly caught in-motion walking towards, not away from, the viewer. While the man looks above and past the camera, the young child returns the camera’s gaze, confronting the viewer and suspending the pleasure of voyeurism. Beneath the paint on the child’s face, an expression permeates that seems to demand, “who are you and what are you looking at?” This returned gaze calls into question the positionality of the viewer—as outsiders, what authority do we have to say what is authentically African and what context authentic Africans belong? On multiple levels, Tanur’s photograph challenges the viewer to reexamine their understandings of Africa and the underlying colonial constructions of authenticity that inform these preconceptions. As several scholars have noted, the concept of authenticity is inevitably problematic for it “speaks in the language of copies and originals, the spurious and the genuine” (Bruner and Kirshenblatt-Gimblett, 1994). Enduring colonial paradigms position “authentic” African cultures as bounded entities set in a frozen past; however, anthropologists now favor more fluid and mutable understandings of culture. The reproduction of culture in Africa, like elsewhere in the world, is a continual social process. 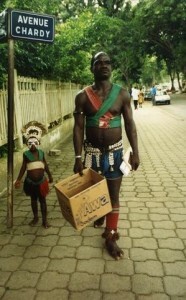 Pulling from this discourse, Rachel Tanur’s image of an African man and child creates an engaging conceptual tension. It invites us to reconsider prevalent ideologies that hold “authentic” Africa and global modernity as opposite ends of a cultural spectrum. 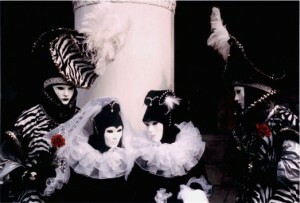 Carnival is celebrated throughout the western world; it is particularly famous in New Orleans. What immediately comes to mind is the stark contrast between the white-faced images of the Venice festival captured here, and the pictures of those stranded in New Orleans in the wake of Hurricane Katrina, most of who were African American. Indeed, when I think of New Orleans’ most famous event, I think of whiteness; of white faces partially hidden by masks and masks painted white. Who would ever imagine in examining Mardi Gras, in its organization, in its media representation, in its exclusivity, in its old-line krewes, that New Orleans is 70% African American? Understanding the dynamics driving the way that Mardi Gras is constructed may very well provide a map for interpreting the post hurricane images that continue to haunt us.